Many of our guests return year after year. Our goal is your happy vacation! We make certain cleaning and maintenance are up to hotel standards. We are all looking forward to the trip next month. It is such an enjoyable and relaxing week. Hopefully, the weather cooperates and the fish are as dumb as they were last year. 40th Wedding Anniversary! Thank you for the wonderful week - relaxing, great kitchen with truly everything! Dock for the pontoon, Grill, Grass for the gang, Cable for the boys & girls, Firepit for late night chats. Our big family was very comfortable & felt at home in Aunt Kay's Cabin. 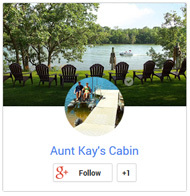 Aunt Kay's Cabin is the largest overall vacation property with the most real beds on the Chain of Lakes. Aunt Kay's Cabin is located on a 6 acre private penninsula with well over 3,500 feet of lakeshore. We have a 50'+ sand beach and a boathouse on the water to store all your beach and boat gear, as well as a place to plug in your music or store some frosty drinks in the beach fridge. The cabin's yard is huge and overlooks the water. A big firepit is great for late night marshmallow roasts and storytelling, with its own patio and picnic table. The main patio has a big gas grill and outdoor sink, along with patio tables, chairs and benches. Indoors, the giant kitchen is fully stocked with everything needed to cook just about anything. The open floorplan for the dining room, kitchen, and living room makes for a great place to gather the whole gang. There are 2 bathrooms (one with a tub), 5 bedrooms, and 8 real beds. There is a queen log bed in each of the 2 upstairs bedrooms, a queen log bed in a downstairs bedroom, a full and two twin beds in the largest bedroom downstairs, and a full and a twin bed in the second largest downstairs bedroom. Plenty of room for everyone!